Well, the natural progression was to think of the marathon. But, I was nervous, scared. I didn’t know if I could do it. Could I do it? How could I do it? 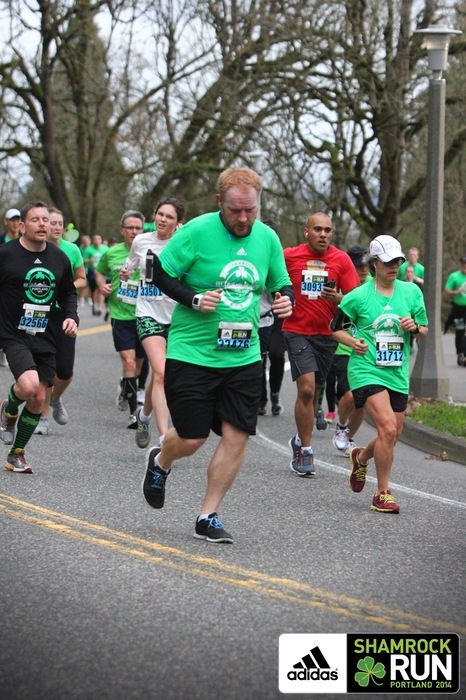 How could I possibly run 26.2 miles? Man, that is far! Well, I was sitting in my Atlanta apartment one day that Spring and I came across and AD for the Chicago Marathon in Runners World Magazine. And the AD said, “ there will be days you don’t know if you can run a marathon. there will be a lifetime knowing you can.” Well, I fell right there; hook, line and sinker. I signed up with the goal being that months later in October, I would arrive in Chicago fit and prepared to explore the city, 26.2 miles of it. But first, there was work to do. 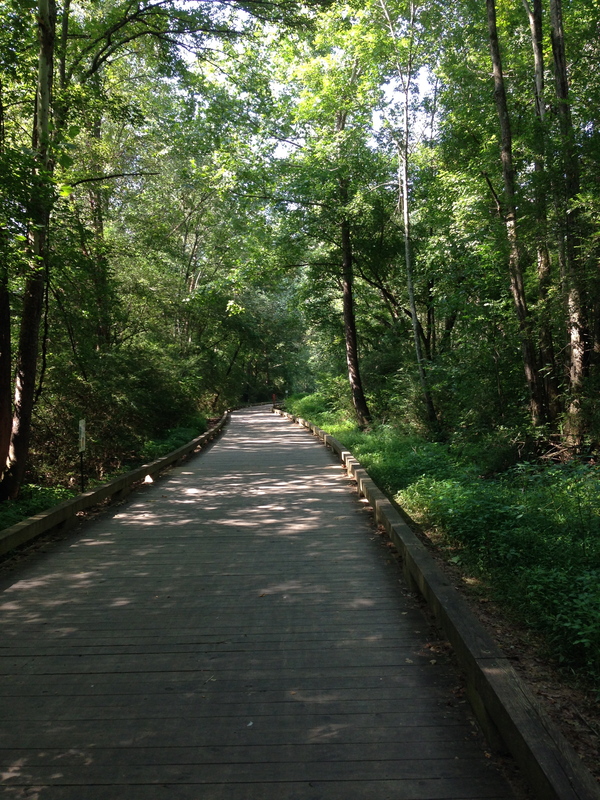 I trained thru the heat and humidity of summertime in Atlanta; conditions were daunting and unrelenting. it didn’t matter what time of day I went out; whether it was 11pm or 5am, the stifling conditions still persisted. I had to find a way to get thru it. That’s the dedication, that’s the committment. Race day arrived and there i was on the shores of Lake Michigan along with about 20k other runners. We listened to the Star-Spangled Banner and then we were off, each to pursue our own personal journey. Those first few miles took us through downtown Chicago amid the booming buildings and stunning architecture. The spectators were 3 and 4 people deep, all cheering us on. Miles further and we explored the Gay neighborhood, the Italian area and the Russian hood…each with it’s own blend of music, aromas, colors and cheers. Mile 20 comes and now I am entering unknown territory as I never went past 20 miles in the training. My feet are aching, feel like they are burning and all I can think is “I have 6 more miles to go” I had to keep moving. 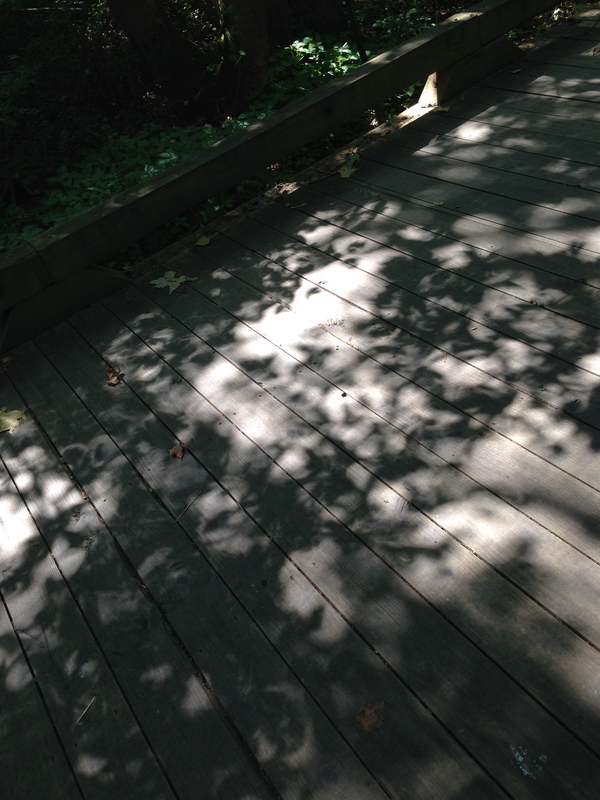 Sometimes a shuffle, sometimes a walk…but movement. I pass mile 23 and I’m starting to move slightly quicker. 1/2 mile to go and I can see the finish line area… people in the stands on the left and right. 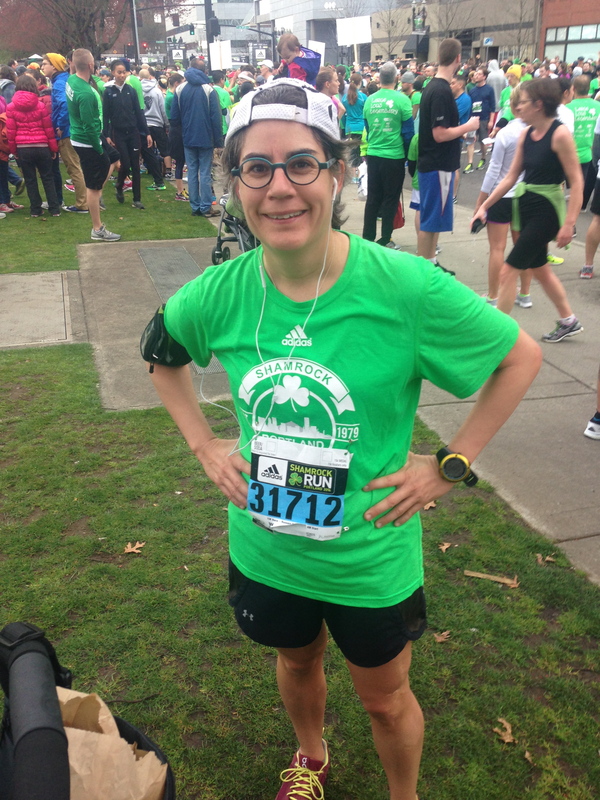 i am now picking up my pace and in full stride, I am screaming, yelling, so beside myself as I cross under the finish line banner of my 1st marathon. An incredible race & atmosphere for my 1st marathon. Where I can just be, where I can dream. Where I notice and I relish. Where I embrace delight, joy, play. Where the familiar astonishes…every. single.time. Where I go to lose myself and then do a 360 to once again, find myself; more whole. Holy. On hallowed ground. Where my senses are resuscitated and my spirit rejuvenated. Where the aromas intoxicate and my heart reverberates. Where I am mesmerized, and laser-focused. Where my lungs gasp for air and my quads reach and reach over the creek and through the woods dashing and dancing over rocks and roots that beg mightily for my crisp attention. My haven. My Heaven. My gentle, constant companion. My desire to go to Boulder was born out of hearing numerous times over the years how cool of a city it is. Recently, it became more desirable as i follow some people on social media who live there and their photos of the mountains have been utterly ridiculous and i became hooked! Bought a ticket, packed a bag & went to see for myself! I needed a break from everyday life as I know it, and I yearned to be in some open spaces, but not remote. What did I want to do while I was there? Hike, scramble on some mountains, run, find cool spots for coffee, food. That’s about it. Mostly, I wanted to be active and explore and I’m happy to say, mission accomplished! The weather was cool the entire trip and mostly overcast with the most random drizzle falling. But mostly, just gray skies. The sun shone itself only 1 day during the trip. If there was any bummer, this was it. Was about 1,000ft elevation change total. 5 miles. Next day, I found the path to what the call is Golden Arch. 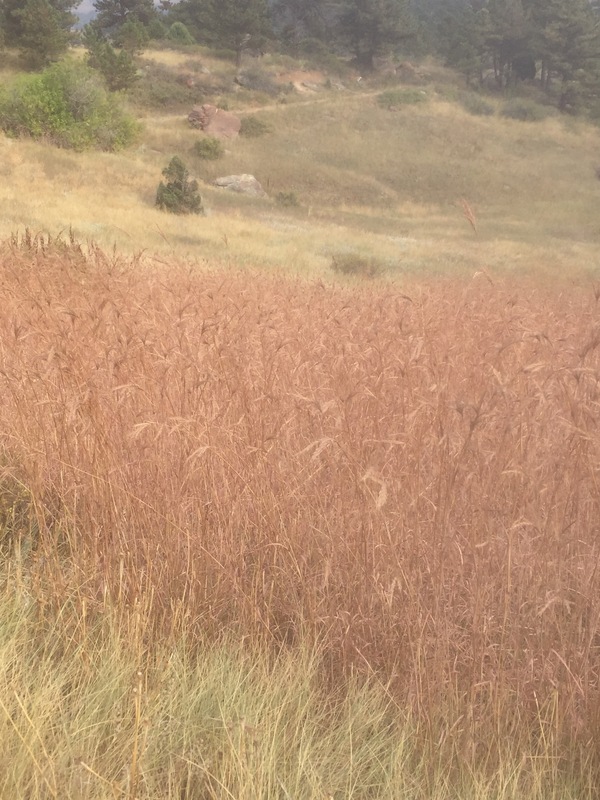 This is in Chautauqua Park (also home to the Flatirons). It was a Friday and the trailhead was super busy and i could see lots of people on the trail. Came to learn it was parent’s weekend at Univ of Colorado so lots of people out and about. With gray skies surrounding me, I headed up to find the Golden Arch. As I climbed higher and higher, I did notice the effects of the altitude, but nothing that felt limiting. Trail begins with a significant view of the mountains ahead and after the 1st mile, trail narrows and becomes more tree hidden and less populated. And more rocky. And then very rocky. Did I say rocky? It’s a full on climb up; maneuvering the changing trail conditions, making sure you’re on the right trail and watching your steps very carefully. FUN. & INVIGORATING. As much as I was breathing hard, I was smiling a bunch, too. With the overcast and grayness, it didn’t make for very “picturesque” photos, but the scenery still looked magnificent thru my eyes. Finally reached the Golden Arch peak at just under 7000ft elevation (from sea level). All in all, the hike was only 3.6 miles but with 1,679ft elevation change! Worth every step. 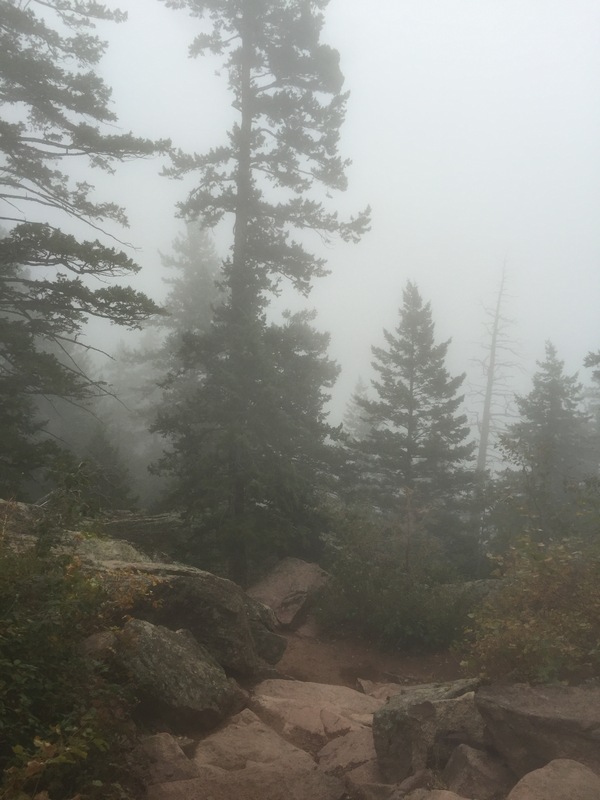 After arrival, I sat atop of the boulders and marveled at the beauty & stillness surrounding me. My breathing slowed and it was as though a hush fell upon the few of us there at the time…a collective knowing of sacredness and appreciation when you see it. We were essentially bowing down to nature, were we not? 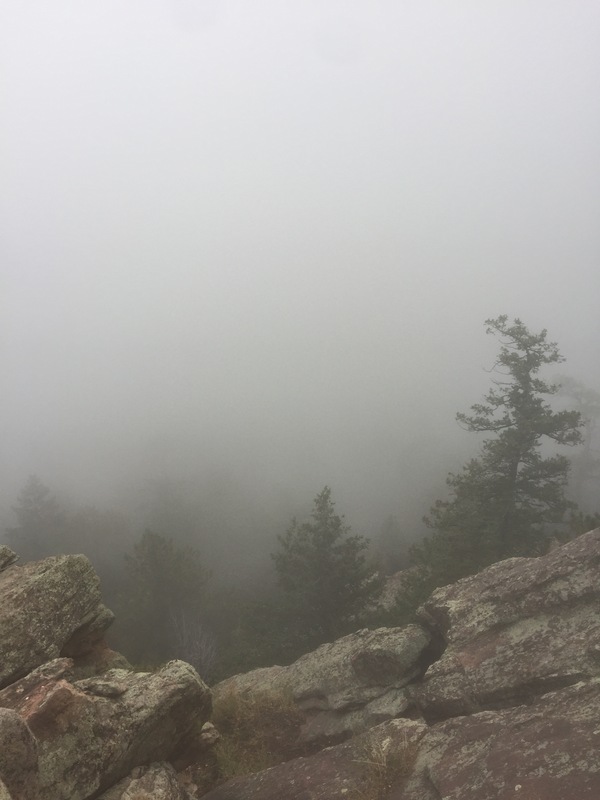 I took a break from hiking the next day and just tripped around Boulder and surrounding areas. I actually did not stay in Boulder, but in a smaller town just south, called Louisville (the S is pronounced!) A combo town of suburbia and quaint, artsy, cozy downtown area. Of course, I found the perfect place for coffee! Super small place in Louisville that’s only been open 6 months called Precision Pours. Cozy, simplistic, minimalistic…just what i like! Oh, and good coffee and a super cool owner, Brice! Did a short 3 mile run later in the day and could feel the effects of both altitude & the previous 2 days of hiking. Next day was the one and only day i saw the sun. Wanted to hit the Flatirons so that’s exactly what I did. The trail beginning is the same as it is to get to the Golden Arch. After the 1st mile, the Flatiron trails are in a different direction. A lot of the same type of terrain as it was to get to golden arch…it felt longer, but was actually shorter distance. Still, a decent amount of climbing for the distance. 1,394 ft over 2.7 miles. Got into a nice rhythm of following this one fella and letting him lead the way cuz some points are so full of rocks that you cannot gauge what is actually the trail. 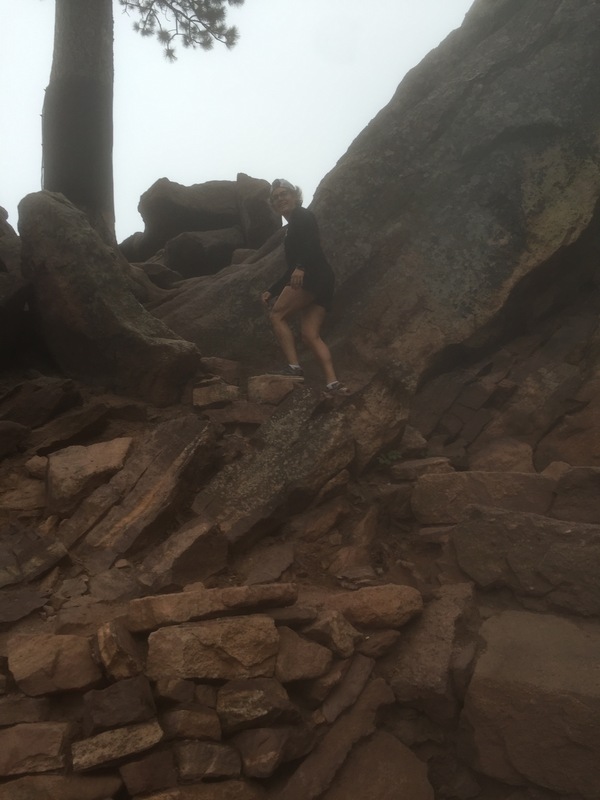 The best part was literally climbing/scrambling up some big boulders to get up and over particular areas. I noticed as I moving higher and higher that I was smiling outside and inside…how happy i was, how invigorated i felt and how i just kept wanting to keep going up and up. A fun, cool feeling! It’s amazing how focused one has to be on trails like this where it is so thoroughly rocky. It’s true meditation…a total zone….beautiful. I was focused on getting to the top, but at the same time mindful of each step, the sound of my breathing, the amazing beauty surrounding me. The senses sharpened! 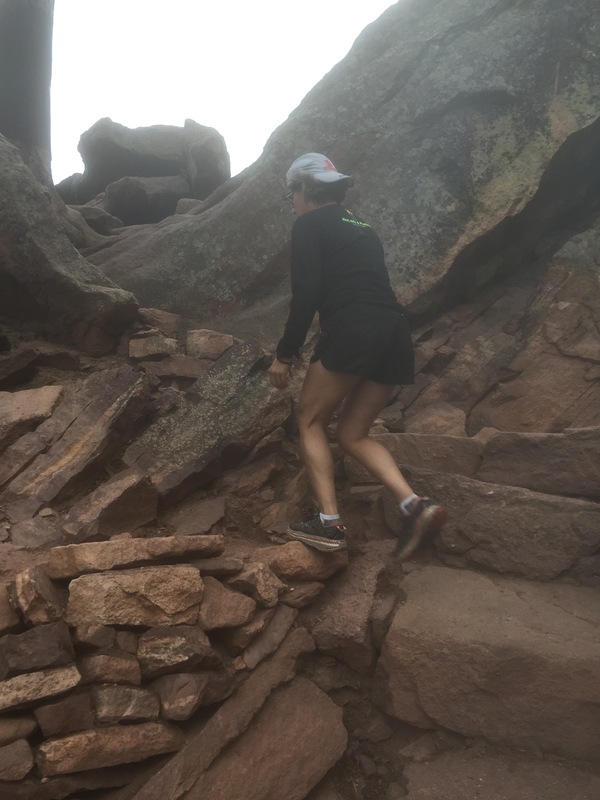 Aware of my legs/quads….the muscles working in tandem with the rest of my body to propel me up, forward; aware of my heart rate climbing…climbing…sensing the sweat gathering on my brow and back. 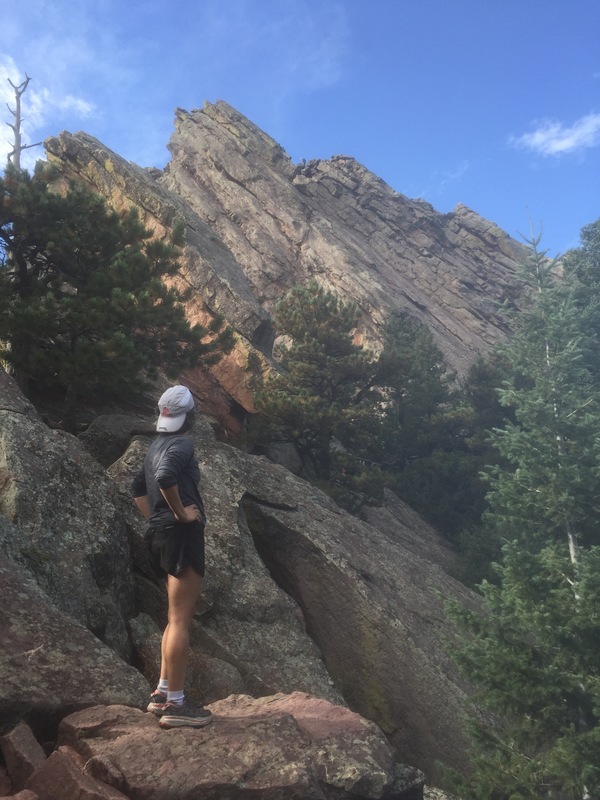 Life happening…there on the flatirons. Finally arriving at the top, empty water bottle in hand and plopping myself down on a rock and just looking out….noticing everything and hearing nothing…the quiet. Ahhhhh…. Last day: coffee and writing & Precision Pours, haircut by an awesome gal and went for a flat, fast 3miler thru downtown Louisville. Zoom to airport. I try to make it a point to start my day with a gratitude list of about 5 things/people. Health is always #1 on my list. For me, it’s so important to be healthy….i want to nourish my body, treat it well…so i can continue to do things like this…I am aware of so many who have serious physical limitations and complications and i’m just so thankful to be in a position of good health. I don’t ever want to take it for granted. I needed this trip. To get away from my usual surroundings, to be away from work and my office, while at the same time remaining thankful i have a job and a lot of flexibility with my work. I needed some different space, some elevation change, some different perspective. Appreciative of the opportunity and for meeting some neat people. May your journey be filled with light, joy, fun, and challenge. Go get it! P.S. I wore my Hoka Stinson ATR’s on the hikes. Perfect. We gathered on the 4th day of July. the day so historically significant, marking the United States independence. Freedom. Freedom. Freedom. I think of the many people who live in places where they are not so free…. We lined up. Some for the 37th time. Some for the 1st time. Or like myself, the 8th time. My 8th go at The Peachtree Road Race. The crowd so full, lively, ridiculously energetic on this early morning holiday. 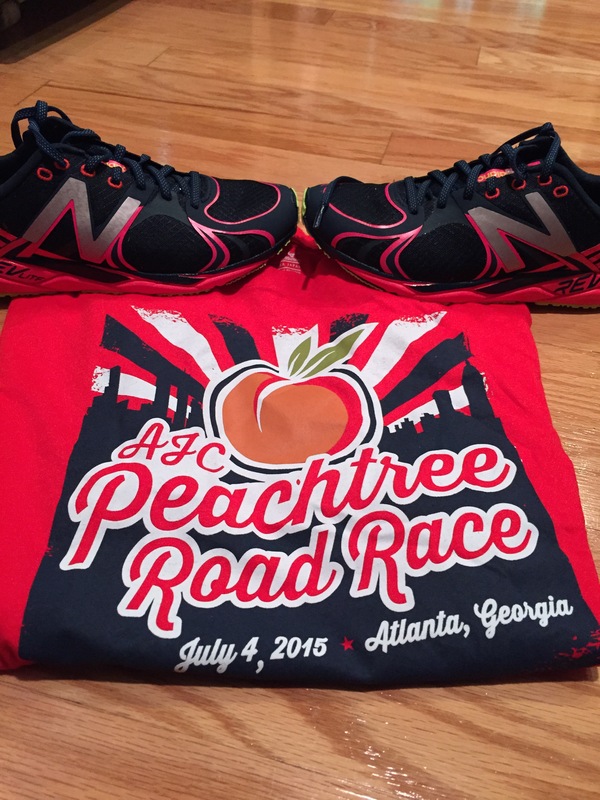 The famed start there at the corner of Peachtree and Lenox Ave…on your mark…. 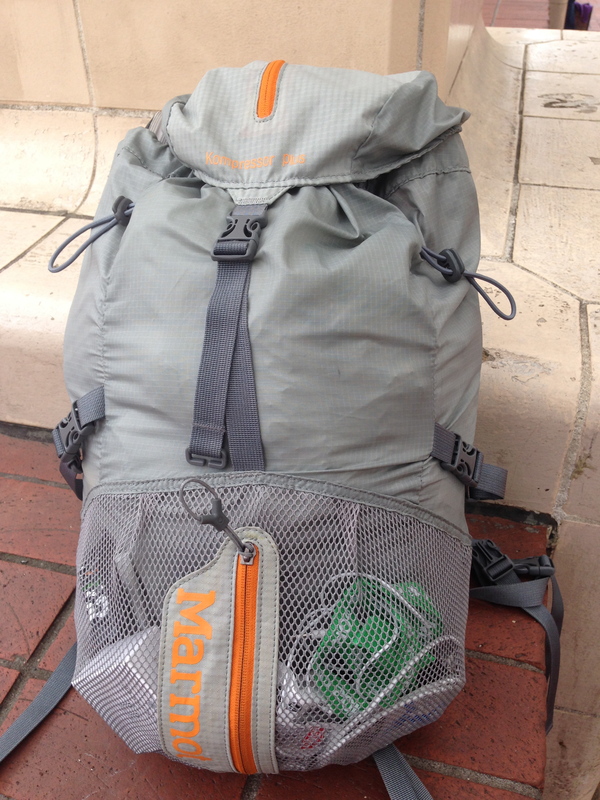 I felt happily light as I had no water bottle, no earphones, nothing with me or in my hands. The sky above was gray & a typical Atlanta thunderstorm was threatening. Bring on the rain, I said. If you know me, than you know I love running in the rain…especially a southern rain. Nothing. Like. It. My goal was to run solid, have fun, soak it all in and push! All week my legs had been feeling heavy, but this morning, all was good. I had a feeling I would have a good day. Sometimes, I can just feel it as soon as I wake up whether I will run well or not….and this morning as I readied myself in the hotel room, I had a good feeling. 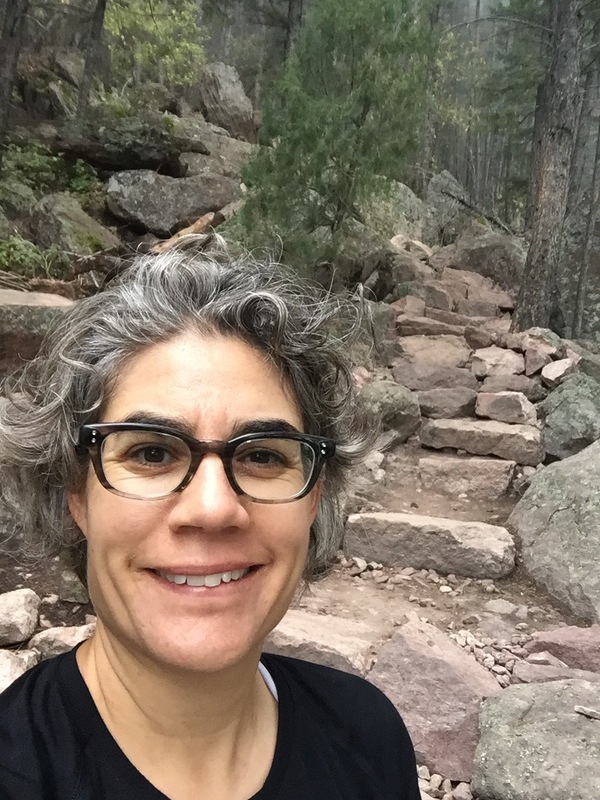 As we started the initial climb up the major hill (Cardiac Hill), I was feeling strong and kept my pace strong throughout…up and over…and onto a flat stretch to mile 4 which starts the long, gradual ascent til about 5.8 miles. It doesn’t ever look difficult but often times in the past I have just really slowed down during this stretch…. Not today; legs in great stride, pushing, feeling my breathing, my heartbeat beating….so happy to be alive and running as a harder rain fell on us all. Ahhhh….that was the moment, my moment…LOVE IT! I turned the corner at Peachtree and 10th and headed fast on the last downhill stretch into the finish next to Piedmont Park. Done, done, done. Another Peachtree in the books. One of the best races I’ve had here and happy with my finish of 56:08. 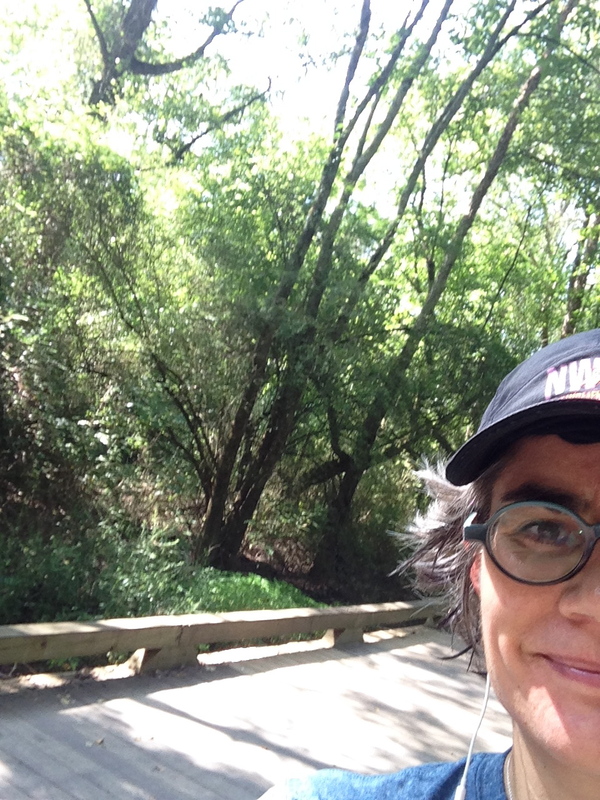 Happy to be healthy and out enjoying life on the roads…. Man, it’s not easy to run at altitude, but it sure is pretty looking and pretty damn awesome! I was up in South Lake Tahoe last weekend and went for a short 5 miler on Saturday. I was in heaven. 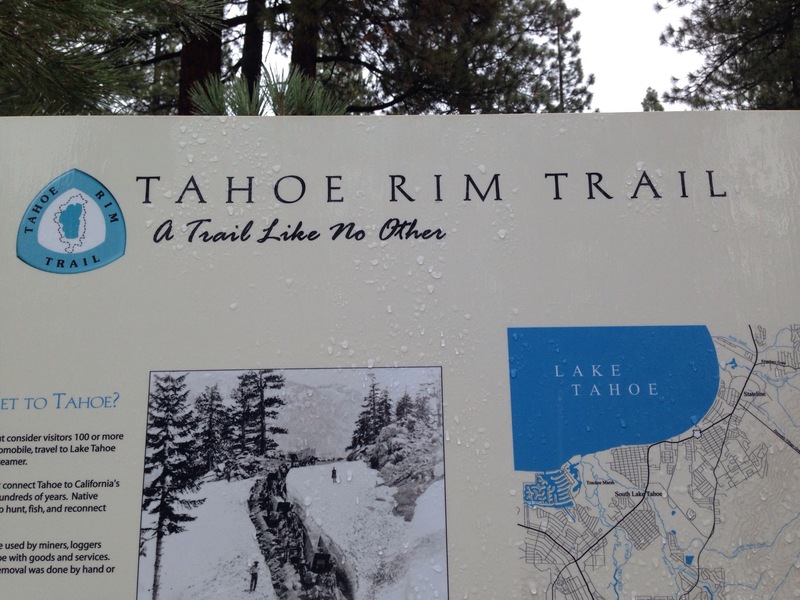 The trail I was on was going to connect with Tahoe Rim Trail, which I had wanted to see, but I didn’t quite get there….That will definitely be for another day. 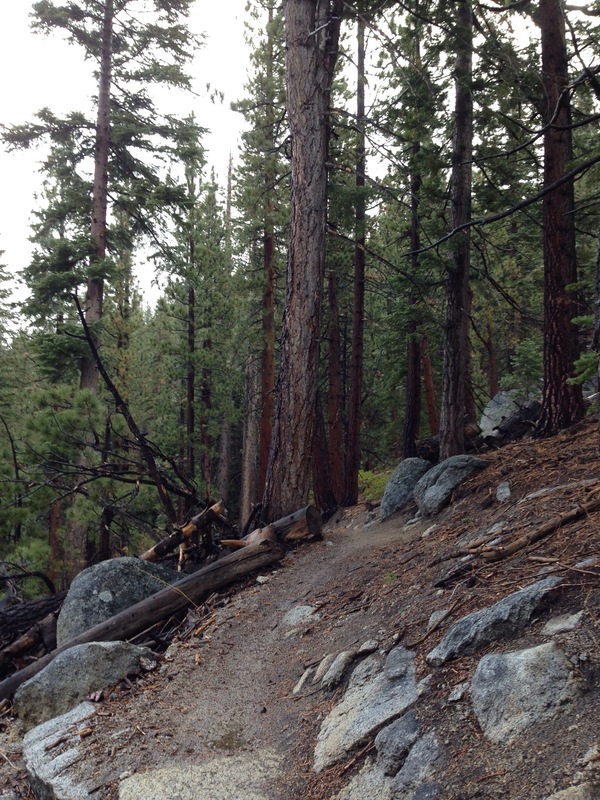 Today was the first time I have ever run on Tahoe Trails and I can say this; I will be back! Stunning! And I only saw 5 miles today. As I looked around, I was just in awe and again, so Thankful for my body, my health, and for living where I can see such beauty. I wanna keep finding more places. 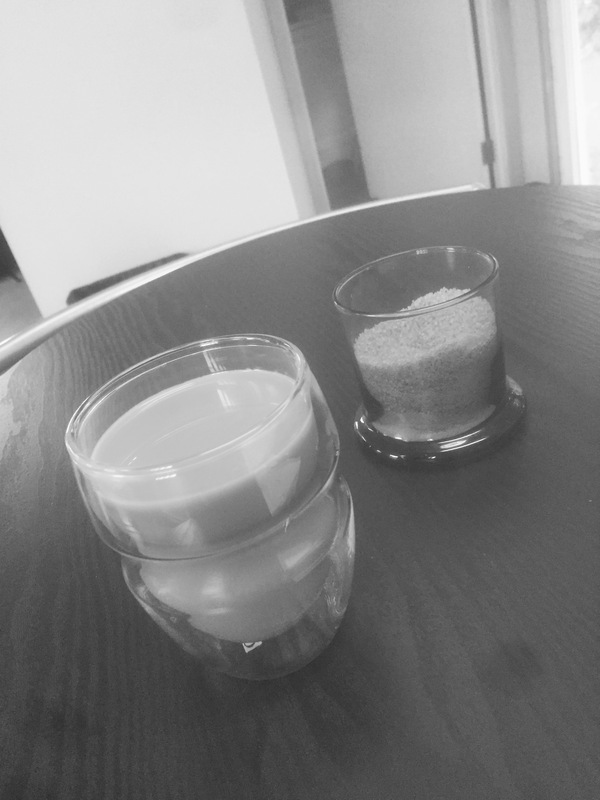 I wanna keep going…. These past few weeks: Another awesome bike ride with Jason. Went out on an mid week early morning. 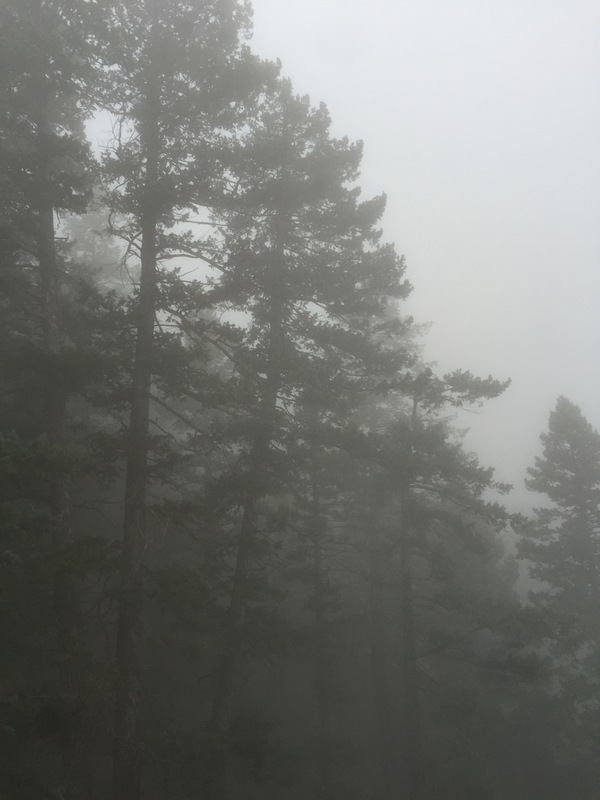 Weather was cool, foggy. I added arm warmers to my body but other than that, stayed with just shorts and bike jersey. We did our same 25.5 mile loop and I felt good. 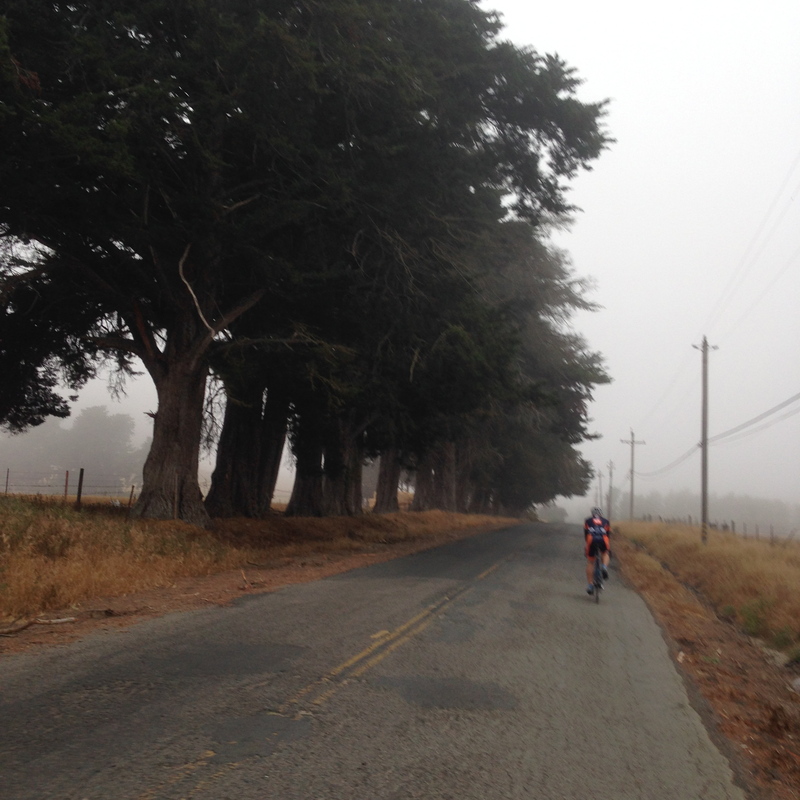 The route was the same but the scenery changed due to the foggy conditions. A different kind of beautiful. So peaceful out there…I love it!! Awesome way to start my work day. The next 2 weeks I traveled to Kansas City, MO & then Atlanta, GA. Obviously, both not easy places to run in during the summer months. I also have learned that for me to try to run the day after a long travel day is absolutely useless. I ran the day after I arrived in KC after long day of getting there. Run was painful. I also ran the day after I arrived back in CA after super long day of travel. That was doubly painful. I think I have learned my lesson. I can do the run of course, I just don’t find it enjoyable after such long travel days….but I feel like I just have to exercise because of all the sitting, etc…hello….conundrum! Anyways, in between those instances, I ran 3 days (4 miles each) steadily in Atlanta and was glad to get those morning runs in before work. Did a lot of driving while there, so moving my body beforehand was perfect! Humidity/heat was not as bad as expected for this time of year. Bonus! 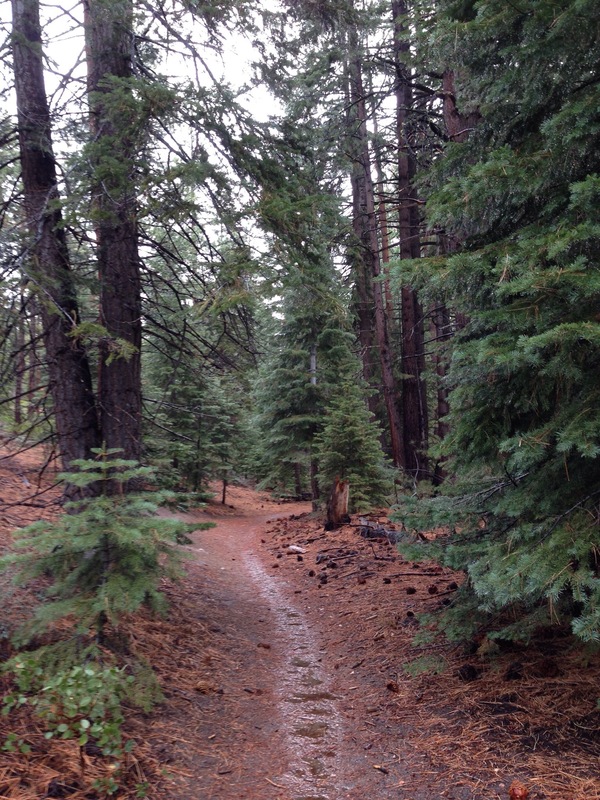 I ran on the same path each day….a flat path with a gazillion trees hovering around. Ahhhh….THIS I miss very much!! The plethora of soooo many trees! Beautiful, luscious, invigorating, and yes, thank you for the shade! The last day of running there was eventful in that I tripped and fell AND then narrowly avoided a snake. I’m sure the snake was harmless, but a snake is still a snake. Also, no scars or nothing from the fall. A tiny bruise, if that. Darn it. 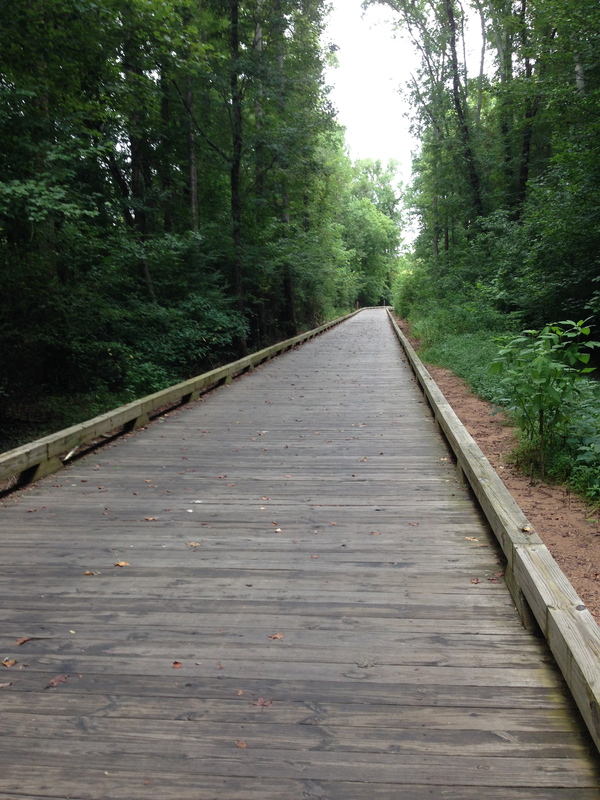 Much of the path is laden with wood planks because the area is basically akin to a swamp. Every morning, it was deliciously quiet out there with just my footsteps and the soothing & familiar sounds of the cicadas. After a full travel day back home from ATL, I desperately wanted to move my body the next morning. I knew I would be sluggish, but I just HAD to move. You know that feeling, right?? Also, after the flat path in GA, I was hungering for the dusty trails of Marin. 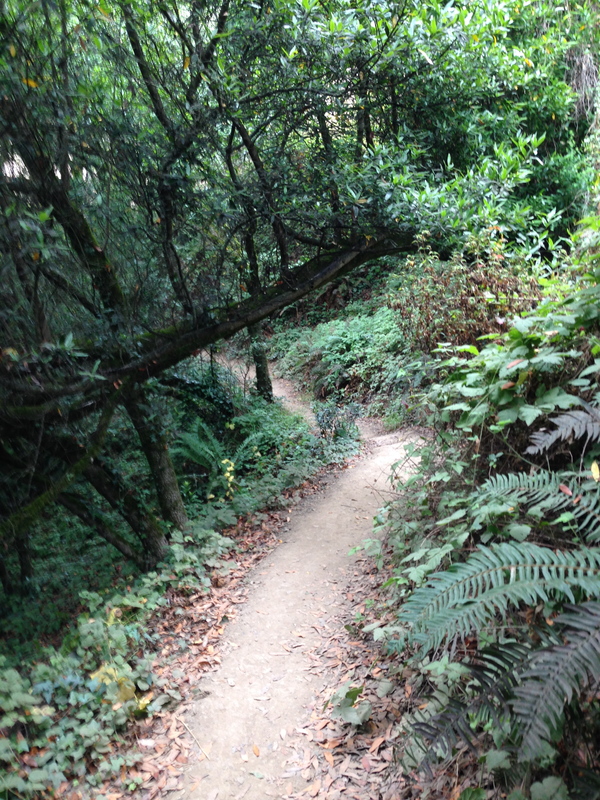 I opted for the Dipsea steps and trail. Ahhh….the steps I crossed with happy, gentle, tired feet…the steps that took my breath away….over to the windy trail with scores of scattered fallen Eucalyptus leaves under my stride. 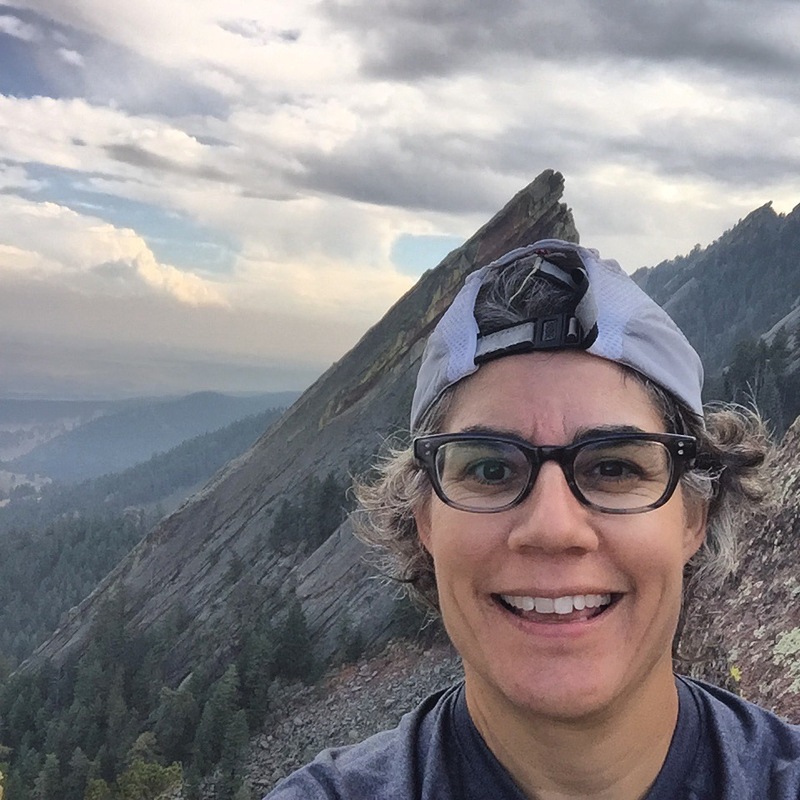 Down and then back up the steep, dusty, rocky, section….my legs happily aching…running over to a section I had yet never been…the sunrise trail that goes .7 mile out and then the same return. 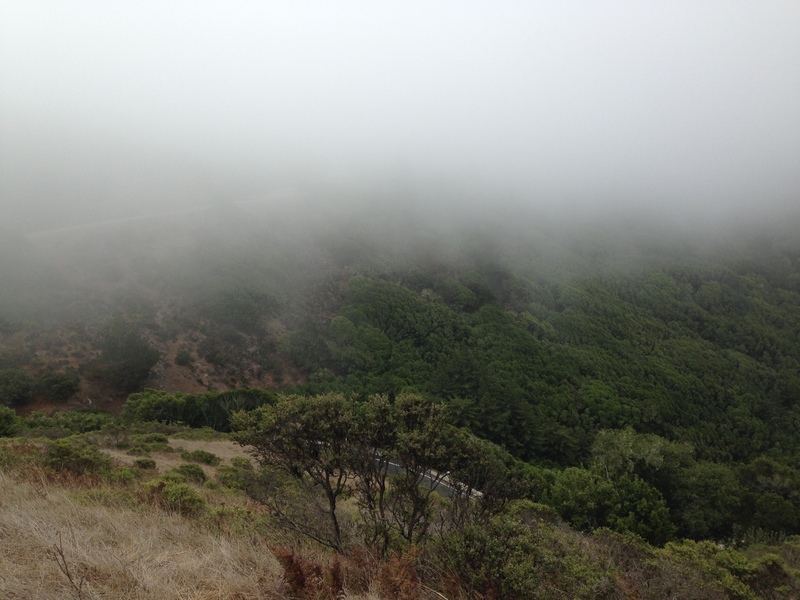 An easy runnable section with fantastic views (even with the cool foggy morning). Taking some deep breaths and smiling, happy to be home again…happy to move my legs, grateful for everything. Back down the Dipsea steps after a slow 5 miles. Just what I needed. 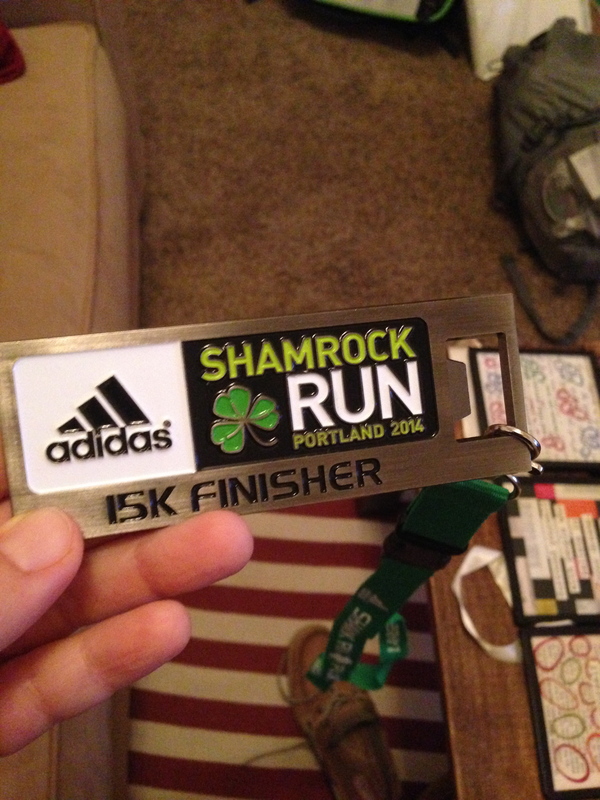 My 3rd and final day in Portland was the day of The Main Event; The Adidas Shamrock 15k Race. My morning began at 5:30am. Made hotel coffee, and ate my customary Clif Bar and banana. I sat and looked outside my hotel window and the still darkened sky, the streets so delicate in their Sunday morning quiet….those same streets would soon be lit up and come upon by 35,000 runners participating in either 5k, 8k, or 15k mile distances. This gray, overcast morning would soon be adorned with bodies of all shapes, sizes, ages, and color wearing their traditional Green race shirts! Time to get on with the party. I walked the short 3/4 mile from hotel to starting line and it was a tad chilly. I wore nothing to keep me warm as I figured as soon as I began running, I would be fine. This was true, however the 30 minute wait until the starting line popped open was chilly. Thankfully, the gathering crowd of excited runners and the beauty of the morning along the Willamette River distracted me from being cold. 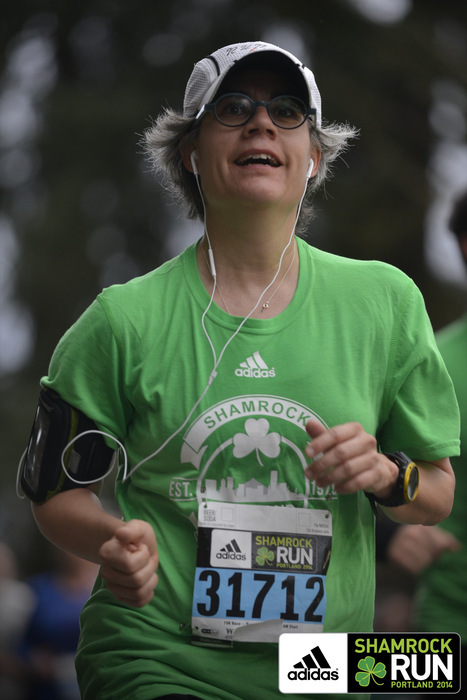 These are the moments that are so fun and if you have ever done a road race or any race, you know what I mean….I love just taking it all in, absorbing the moment, and watching the congregating of a bunch of strangers on a street to go run their hearts out. Absolutely love it. 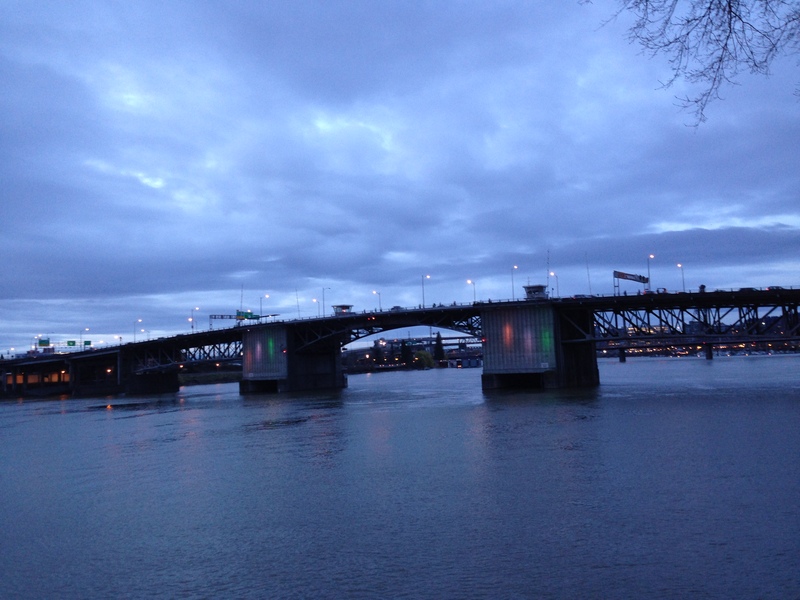 I looked across the river to the east side and smiled at the grayish-bluish sky emerging from the darkness. There is nothing quite like the beauty of a morning, is there?? I think that is why I am an early riser…I hate missing it! The combination of the walk to starting line and some time warming up along the rivers pathway, I felt loose and ready to go. I was actually gonna RACE, not just go for a run! My goal was to have a finish sometime between 1:26-1:28 which would be an average pace of 9:15-9:28 per mile. Obviously, I was hoping to be closer to the 1:26 finish. I thought my chance was good if all went well, so we were about to see! The first mile is headed south and flat, going in the opposite direction of downtown where race began. After mile 1, you make a left turn and head back towards downtown and it’s basically straight & flat for the next 2-3 miles. The crowds were sparse in the beginning but there were some festive folks out…a few fellas playing the bagpipes and another band I think. 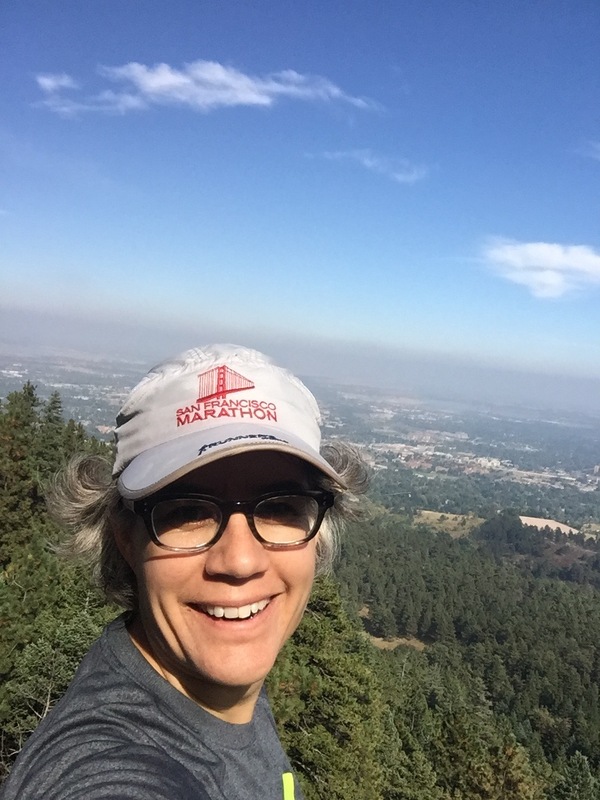 On the north side of downtown, the small climb started as we ran next to Portland State University and then up more to pass Oregon Health & Science laboratory and Marquam Park. These were miles 3.5-6 approximately and they were a steady incline along wide windy roads. Beautiful and serene atop the higher areas. I was doing well on time. My first 2 miles were actually less than 9 minutes each and I made a conscious decision to slow down or else I might have nothing left in the later miles. The total ascent was only 550-600 feet, but I could feel it as I have run nothing but flat in preparation. I did some repeat hill sessions, but nothing major. Anyways, I was feeling good as I was watching my time and passing the mile markers. I was taking a gel every 2 miles and this was perfect. I was pushing throughout, but as the descent started to occur I really took off and pushed harder. I had lost some time on the climb and I wanted to make sure to beat my goal since I was now so close !! Breathe. Push. Keep going! I was aware of everything and nothing. Such a cool, amazing feeling. Very freaking happy with this. It shows my training has paid off. Everything came together on this particular morning. I was happy and delighted and proud of my efforts! Another cool thing in addition to the race shirts I received was this unique race “medal”…a bottle opener! i love it. I happily walked back to hotel and spent the rest of my morning/afternoon back in the Pearl District. Enjoyed a delicious breakfast at Cafe Isabel and then roamed around with my travel pack before heading to the airport and home. A fun and full weekend in this Pacific Northwest city I have been wanting to visit! Thank you, Portland! !